ATCPrep.com™ allows you to review and evaluate your training performance providing comprehensive analysis tools. Scores and performance statements are both compiled and reported in great detail to support your preparation. The software provides feedback during and after test runs. Your long-term performance development can be tracked in statistical graphs and tables. 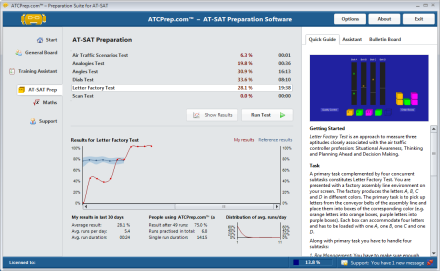 Using ATCPrep.com™ in your preparation for AT-SAT screening you will be able to compare your score in the tests with reference scores. This feature will help you judge your individual performance development.